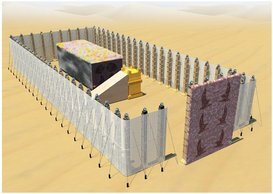 Last week’s Parsha detailed plans for the construction of the Tabernacle. Tetzaveh describes the clothing worn by the priests – Kohanim – who are to perform the Divine service. Every Kohen wears four garments: short breeches, a floor-length tunic and a hat, all made of white linen, along with a multicolored belt. The Choshen, or breastplate – a square of fabric worn over the heart. Twelve colored gemstones in golden settings – four rows of three –are engraved with the names of the twelve sons of Israel. The Ephod – a sort of apron encircling the priest’s back, tied with a belt in front. Two shoulder straps rise from the belt and come forward over the High Priests’ shoulders; hanging from the shoulder straps are golden chains bearing the weight of the Choshen. The Choshen and Ephod are woven of blue, crimson, purple, white and gold threads intertwined. Concealed within the folds of the Choshen is the Urim VeTumim, a piece of parchment inscribed with G-d’s name. The Urim VeTumim is a vehicle of prophecy: a Jewish leader seeking Divine guidance can ask the High Priest a question, whereupon various letters on the stones of the Choshen light up, spelling an answer. The Me’il – a tunic of sky-blue wool, worn on top of the white linen tunic. The Me’il was fringed on the bottom with golden bells and “pomegranates” –balls of blue, purple and crimson thread. The High Priest wears all eight garments when performing his regular duties. On Yom Kippur, when he enters the Inner Chamber of the Sanctuary, he wears only four garments – the four worn by the ordinary Kohen – all made of white linen. Gold ornamentation would be reminiscent of the sin of the Golden Calf. Aaron, Moses’s older brother, is designated by God as Kohen Gadol, and his descendants as Kohanim for all time. Aaron and his sons are to assume their responsibilities on the first of Nissan, after a seven-day installation ceremony.